A part-time MBA program can be a popular option for students who want to keep their jobs while preparing for advancement. Part-time students may pay more upfront because it will take longer to complete an MBA. Part-timers are buying time that pays off in the future in terms of career advancement and earning power. A part-time MBA program may be the best choice for managers already employed in leadership and seeking the quickest path to credentials and/or advancement. Full and part-time outcomes may vary based on factors such as school reputation, expertise of faculty, and student performance. Look over the course listings. When evaluating programs, contact the business schools on your short list and ask for graduation rates, time from degree to employment, and if the graduates advanced or received an increase in salary. Our rankings of the best schools should kickstart your evaluation of part-time MBA programs. Students with 5+ years of relevant experience may be selected to participate in Missouri State University's program to complete an Executive MBA. Curriculum is customized to your academic and professional history in order to provide the most efficient path to graduation. Learners must maintain a 3.0 GPA in 18 credit hours of foundational work and 33 credit hours of business core classes. You will develop skills in managerial finance, business research, legal issues and the fundamentals of economics. 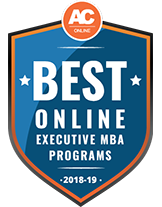 Over the course of 19 months and 6 modules, students participating in Purdue University's hybrid Executive MBA program will complete 48 credit hours. Each module includes an 8-10 week online preparation period, 1-2 week residency and cumulative exam. Learners will participate in group projects and field experiences to apply skills and build a networking community. You will also be connected with a career counselor to assist in reaching professional goals. Applicants need to submit transcripts demonstrating completion of a bachelor's degree, proof of 5+ years of work experience and 2 letters of recommendation. The hybrid option to receive an Executive MBA at the University of Texas at Dallas emphasizes global leadership. The majority of curriculum is delivered in an online format through the use of live web conferencing. Students are also expected to participate in 2 international experiences and 3 weeklong campus visits. Enrollees can utilize the Naveen Jindal School of Management Career Management Center for networking and career opportunities. In order to qualify you must hold 6 years of professional and international experience, as well as a 3.0 GPA in your bachelor's degree. At Texas Southern University, students admitted to the online Executive MBA program can specialize in energy finance or general business. Both pathways take 2 years to complete 36 credit hours in curriculum covering strategic marketing, management theory and global strategic management. You will also partake in an international business trip toward the end of coursework. Classes are delivered through Blackboard Academic Suites and utilize teleconferencing and live chat rooms. Prospective students must hold 5+ years of professional experience. Admissions also consider your GPA, statement of purpose, 2 letters of recommendation and resume when making a decision. 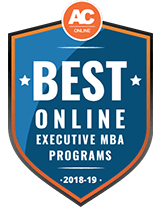 The hybrid program to finish an executive MBA at the University of Alabama combines online classes with on-campus visits that take place 1 weekend each month. Over the course of 5 semesters, students fulfill 48 credit hours in topics such as negotiating, communication and supply chain management. Toward the end of your studies, all enrollees come together for a study abroad experience. Applications must demonstrate a minimum of 5 years working experience and a 3.0 grade average in undergraduate coursework. The online executive MBA program at the University of Hawaii at Manoa utilizes live videoconferencing technology to engage students and create an interactive experience. Learners fulfill 48 credit hours over the span of 22 months in classes such as Marketing Management and Accounting for Decision-Making. Applicants must possess 5 or more years of work experience and a minimum 3.0 grade average in their bachelor's degree. Around $140,000 in scholarships is awarded specifically to online EMBA students each year. The College of Business at the University of Nevada, Reno is host to an online option for completing an Executive MBA. Alumni have entered positions as project coordinators and development managers at universities, research institutes and government entities. Over the course of 2 years, students work through the required 36 credits with the same cohort. You will develop skills in decision-making, branding and managerial accounting. Admissions eligibility is determined by 5+ years of relevant work experience, a minimum 2.75 GPA in academic history, GRE or GMAT scores, a resume, a personal statement and 2 letters of recommendation. Professionals with a minimum of 5 years work experience and a 3.0 GPA in undergraduate coursework are eligible for admissions into the University of North Alabama's executive program for earning a master's degree in business administration. Curriculum is offered in a fully online format and entails 34 credit hours in topics such as career planning, marketing analysis and business ethics. The Success Center connects students to resources such as writing assistance, tutoring and advising services. Students enrolled in the Executive MBA program at Florida Atlantic University will spend 23 months working through 40-46 credit hours. Core curriculum explores accounting, leadership and global management. You can also select among concentrations including international business, health administration or big data analytics. Although certain classes are offered online, most are delivered in a weekend format, requiring students to visit campus once every 3 weeks. Applicants must possess 5 years of professional experience, as well as a 3.0 GPA in undergraduate studies. Q: What is a recommended study schedule to complete a part-time MBA? A: Successful online, part-time MBA students can expect to devote 12-16 hours per week of study time for each course. In part-time programs that can be completed in 24 – 30 months, students may spend 20 hours a week completing their assignments and another 20 hours a week participating in online classes. Completing a part-time MBA can take one to three years, depending on frequency of class meetings, or individual student circumstances. Q: Which specializations are offered in a part-time MBA program? A: The range of disciplines in a part-time MBA may vary by the business school and its institutional requirements. Common concentrations include Accounting, E-Business/E-Commerce, Economics, Finance, Global Management, Healthcare Management, and Human Resources. Q: Can you earn a part-time MBA without a prior business degree? A: Non-business undergrads or applicants with limited work experience (less than two years) in a business-related field may be suited for a part-time MBA bridge program that combines classroom hours with practical learning activities such as internships in business settings. Bridge programs can take one year (and a summer) to two years to complete. Not all business schools offer bridge programs. Q: What are the emerging fields in business management to pursue? A: Some of the fastest-growing specializations for MBAs include Cyber Security, Change Management, Environmental Management, Homeland Security, Agri-Business Management, Global Business, Digital Marketing, Entrepreneurship, Energy Efficient and Clean Technology, and Media Management. Q: Which activities will boost my career during the part-time MBA program? A: Depending on the part-time MBA program, students may choose to use real-world business problems from their employer as class projects. If solving the problem increases the bottom line or updates current strategies, you may become a workplace hero. Consider taking so-called “informational interviews” with professional contacts to boost career networking opportunities, find mentors or learn about your chosen specialty. Q: How much can managers earn? A: According to the Financial Times, “managerial salaries rose by $7,000 on average in 2017. Earnings for healthcare and industrial managerial positions increased 10 percent, with an average annual wage of $143,000.” The U.S. Bureau of Labor Statistics reports that “the highest annual mean wages for MBAs in 2017 were in the management fields of scientific research and development organizations ($148,610), companies and enterprises ($132,460), and management of computer systems design ($136,080).” PayScale cites an annual median salary of financial managers at $114,743. Each business graduate school establishes MBA completion requirements and classwork that is mandatory, such as comprehensive core classes and major studies in your MBA specialty. Future MBAs concentrating in real estate law and marketing learn how to perform a competitive market analysis, develop strategic marketing plans, and learn marketing ethics. Focus is on twenty-first century promotional problems and solutions. Course covers theories in accounting and managerial decision-making strategies. Learn effective concepts for organizational control and planning using accurate statistics. Study the variable agents in the economy that are key to your decision-making process. Measure performance in a market-oriented economy. Entrepreneurship: Creating culture and teamwork. A comprehensive overview of evidence-based tools for motivating employees and building effective teams in today’s ever-changing business landscape. Computers and communication devices have revolutionized business practices around the world. Today’s managers must learn operative strategies while understanding differences in culture, language, marketing techniques and financial practices. The GFSA offers a $10,000-$20,000 Minorities in Finance Scholarship open exclusively to African American, Asian, Hispanic or Latino, American Indian or Alaska Native, Native Hawaiian or Pacific Islander students. The non-profit HIMSS Foundation offers $5,000 in scholarships for students pursuing a business degree in healthcare information or management systems. The Lint Center for National Security Studies, Inc. is a non-profit clearing house for scholarships devoted to students planning to go into national security or global intelligence fields. Merit-based scholarships include the Lee and Byun International Relations and Cultural Awareness Scholarship, U.S. Army Counterintelligence Special Agent, Staff Sgt. Richard Eaton Jr. Memorial Scholarship, and Maj. James W. Dennehy Esq. Scholarship. AAUW offers $2,000-$12,000 in scholarships to women holding baccalaureate degrees who want to return to the workplace with advanced skills or those planning to change careers. The Consortium for Graduate Study in Management. The consortium administers the Leslie Elise Adkins Endowed Scholarship which offers full tuition to qualified scholarships to African American students, particularly women, and students attending Tuck School of Business at Dartmouth College or USC’s Marshall School of Business. The foundation assists promising gay, lesbian, bisexual, and transgender students, currently supporting 73 Point Scholars and 25 Community College Scholars, including business and accounting majors. Sample free webinars and articles, more resources if you subscribe to one of the nation’s leading publisher of business news and trends, breaking stories, and learning tips. The Association of MBAs provides information for students and teachers in MBA schools. Find answers on applying to MBA schools and the entry tests to qualify for the admissions. Preparing for the GMAT? Find resources for free GMAT preparation exams, daily study plans, and reviews of GMAT study books. Among the critical websites serving MBAs and business, The Economist serves up articles on world politics, business & finance, and economics. Resources include articles on MBA core knowledge, leadership skills and going digital. Whether you plan to join a start-up company or go into business consulting, Entrepreneur provides videos, podcasts and articles that address topics like business intelligence, franchise opportunities, education and training. Since 1913, BGS has served as the nation’s International Business Honor Society and an MBA community organization for networking. Members can search for internships, test preparation tools and academic scholarships. Can I Get a Part-time MBA Online? Part-Time or Full-Time MBA: Which is Right for You?